This entry was posted in Festival, Llangollen, Uncategorized on July 11, 2013 by cantabilegirlschoir. The sun was not the sole cause of a mini heat wave today in Wales – the Senior Children’s Choir class was a scorcher! What a great competition full of incredible choirs from all over the world. Cantabile was proud to be part of such a fantastic competition. Eleven, out of the twenty-one Choirs singing their hearts out, had travelled to the UK to compete. Amazingly Cantabile won the class (90.7), with Russia’s Jazz-Choir of the State Children Philharmonic Society a close second (89.7) and Estonia’s Estonian Radio Children’s Choir third (89.0). “Wow!” was how the Adjudicator, Ralph Allwood MBE, started his feedback to Cantabile with their performance of the Tiree Love Song with “a wonderful full sound … very difficult to fault.” He then described their rendition of Dance to your Daddy as a “Tour de Force … effortlessly sung” despite the complexity of the arrangement. Jo Williamson was delighted to be awarded The Musical Director’s Award which is given by the Eisteddfod’s Music Director, and was inspired in part by the choir’s performance of the Tiree Love Song, arranged by Michael Neaum. 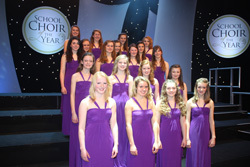 This entry was posted in Competition, Festival, Llangollen on July 11, 2013 by cantabilegirlschoir.